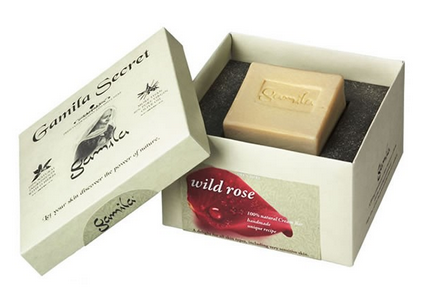 The truth is that not all soaps are created equal– there is everyday soap that does the job, and then there is Gamila Secret. This is a beautiful bar of soap, which is hand blended and uses 100% natural ingredients. It cleans very deeply, but because it’s so soft and foamy it also encourages the skin’s capacity for self-repair, hydration and promotes its elasticity. You can use this unique formula on your face or body and it can be used by all skin types, including sensitive skin. As it restores the natural balance of your skin it gives it a luminous and radiant complexion. Ingredients include: a combination of 15 different plants and unique mixture of herb extracts, natural oils and extra-virgin Syrian olive oil, all of which have excellent anti-oxidant potency. The soap was created by Gamila Hiar – born in 1940 – who was the daughter of an expert on plants and an authority on medical herbs . She lived in Northern Israel and developed this secret formula, based on the wisdom of nature, which has become known as Gamila Secret. This really is a beautiful product, and one that will last you months. I have a tiny bit left, which I use to wash my face every day and enjoy the texture and scent it leaves. If you like wholesome products, give it a go, you will love this. Gamila Secret is available in original and in lavender and can be purchased online at qvcuk.com and is priced at £16.44. For more information go to gamila.com. This entry was posted in Skincare, Wellbeing and tagged bright skin, cleansing bar, gamila secret, holistic, soap. Bookmark the permalink. How can i get u r products. I always enclose this information at the end of each blog entry, but do let me know if you have any specific queries. Thanks!